Hooyah!, a tribute to the Navy Seals, is a challenging, elegant co-op with mounting tension and no violence. Pleasant co-op surprise! In Hooyah, players take on the roles of Navy Seals, each with their own specialization, and work together to gather provisions to complete up to five Operations (Ops) in preparation for one final mission. One player, who is assigned as the Lieutenant Commander, leads the team through the dangers and tests of skills. If just one member of the team fails then the mission ends for all players. If all the Seals successfully plan and prepare for the risks ahead, the order can then be given; the battle cry of the Navy Seals: Hooyah! Each Player chooses or is randomly assigned one of 10 Navy Seal cards that defines their role and specialization in the game with one exception; one player must be the Lieutenant Commander (LC) for the game and will issue specific orders and command the team. Players also take 5 health tokens. The Ops/Events deck is shuffled and two cards are dealt into five rows. These rows represent the five Operations that players must complete in preparation for the final Mission. The two cards in the first Ops row are turned face up revealing two numbers in a colored field. These Ops cards present the players with the objective of the current Operation: collect the displayed number of colored cards. There are five colors that represent the important skills used in the game: yellow for air support, blue for aquatic skills, purple for tech skills, red for marksmanship, and green for physical training and strength. The Time Counter’s dial is set to the total value of these two Operation cards and is placed in front of the Lieutenant Commander. The Skills/Equipment deck is shuffled and five cards are dealt face-up to a Provisions area. Players on their turn will collect cards from this area in order to gather the number of colored cards that match either or both of the two face-up Ops cards. There are also Equipment cards that provide an added game effect as well. Subsequently, one of five Mission cards is chosen, placed in a holder and set up where all players can see. The mission card contains a Mission Event, as well as conditions the players will have to meet to win the game. The LC always goes first. The Prepare Phase: Players gather Skill/Equipment Cards to gather the necessary cards to complete the current OP. Each player in turn, may draw two cards from the face-up Provisions cards or draw one at a time from the top of the Skill/Equipment deck. Players seek to collectively gather a number of colored skill cards equal to or more than the numbers on the two face-up Ops cards. During this phase the LC may also call a role call, to allow each Seal in turn to report on an amount of one color skill they can contribute to the OP. (Example: I can provide 3 Air Support (Yellow) Sir!). If the LC feels that the players can safely achieve the OP, the LC calls Hooyah! And the Ops Phase begins. The Ops Phase: After Hooyah! is called and before players may combine their cards to complete the Operation, they must face a number of Events equal to the number of players plus the number of the Operation. Most Event cards test a Seal’s skills, and may require that player to produce a card of the matching color of the Event, (Blue for Aquatic and so forth.) Some Events have special effects that can profoundly affect a player’s ability to support the current OP, even doing bodily harm. After all the Events have been faced, the players now reveal from their hands the cards that are necessary to complete the OP. Success means revealing OP cards in the next row and beginning the Prepare Phase for the next OP or the Mission itself. Failure means a loss of one health for all Seals, loss of all cards in hand, and attempting the same OP again. The Mission Phase: After the 5th and final OP is completed successfully, each player faces an Event, and then all players may attempt the Mission. Each player, beginning with the LC, reveals cards from their hands to complete the specific color/skill requirements listed on the Mission card. Success means Victory for the team! Failure means a loss, returning to base with a better idea of what it takes to be better prepared an setting up the game for another play. All of the components for Hooyah are of very high quality. Simple and elegant, the artwork and graphics by Joe Boginski and Jody Boginski-Barbessi are done with an eye for detail and utility; being easy to read, see and understand. The rulebook, is formatted well, with ample illustrations and sidebar explanations; making the game easy to learn. Real-life backgrounds on the five Missions in the game are included, but not necessary to enjoy the game. Hooyah is easy to learn and begin playing in 10 minutes. As with all good games, learning the complexity of the interaction between players and real tactical planning for mission success takes experience and repeated game play. Who would enjoy this game? Hooyah is not a war game. It is a perfect window into the lives and work of some of America’s bravest men and women. Simple enough for children to learn and play with an educational value that most parents will appreciate. Hooyah doesn’t offer a social party-like atmosphere, it can be tension filled and challenging and with possible failure. It won’t please Social Gamers. Although there is an element of luck in card draws, there is a specific strategy used in coordinating efforts and planning ahead for completing Ops. Not a lot of strategy, but enough to make players think ahead before acting. It’s a possible Strategy gamer Co-op. The game is easy to learn and simple to play. Any Casual Gamer, even if the subject matter doesn’t interest them, will enjoy the game. A pleasant surprise for the Casual Gamer. Hooyah is challenging, and nothing tempts an Avid Gamer like a challenge needing to be conquered. With 5 missions of increasing difficulty, player interaction and a great solitaire version, Avid gamers will get their money’s worth. There are a bit too many random and unexpected dangers for the Power Gamer. The game creates a sense of constant danger with unexpected tests of skill. The random and less tactical elements of the game won’t satisfy a Power Gamers itch. Initially, the subject matter of Hooyah: Navy Seals Card Game may not spark your interest; unless of course you are a war-gamer or have a military background. Honestly, there are those specific genres that seem to entice the gaming community more than others. But don’t be mislead, Hooyah is much more than a war themed game…much more. Mike Fitzgerald has ingeniously created a game that captures the feel of the challenge and rising tension that one would imagine is created when facing unthinkable real-life dangers without violence or controversial subject matter. Fitzgerald manages to do this with an elegant system that is less specific, less blatant and very intuitive. Using simply colors and numbers and some Seals imagery, the game’s objective rests firmly on the shoulders of the players, their interaction with each other and of course, communication. These challenges can only be overcome with training, expertise and teamwork. On the subject of teamwork, many cooperative games force players into a situation where often the alpha player at the table suddenly becomes the boss, playing the game for the other players, diminishing the teamwork aspect of the cooperative motif. In Hooyah the player who is the Lieutenant Commander IS in charge and by the rules (of the game and the military) all players must answer to and defer to the LC’s decisions. Give the LC role to a more timid player and see what happens! The Time Counter device is a wonderful balancing mechanic that creates a time limit based on the difficulty of the Operation being attempted. Each of the 10 Navy Seal character cards also have special abilities that when combined create a sense of unity in the group rather than creating conflicts on who should do what. Combined with the LC’s role, this produces a very tight foundation for player interaction. The rising tension of the game is manifested in the five Operations that players must complete in order moving up a visible ladder to the main Mission card. Trouble is, events that can use up your resources before attempting the OP increase in number as the game progresses. In a four-player game, for example, by the 5th OP, players must face 9 event cards (two per player plus one). In preparing for the Mission and Ops you plan and prepare as much as possible, but the real threat of failure looms ever-present. Hooyah excels as a solitaire game. In fact, Fitzgerald admits that the game was developed and play-tested solely in solitaire mode long before testing with other additional players. For this attribute alone, where most solitaire rules fall a bit short (who wants to play alone? ), the tension and challenge immerse a player even in solitaire mode – a tribute to the game’s tight design. Mostly though, in Hooyah you have a game that doesn’t beat you over the head with theme. The danger is portrayed through tension not graphic violence. It doesn’t need minis or maps. The Missions are real-life missions, and if you feel inclined to read about them they are included in the rules. The weaponry exists as Equipment cards that provide an image, name and special ability but not damage values or ammunition ratings. As a family game, the basics of color/number matching, preparation and cooperation to achieve a goal are all qualities that parents would be proud for their children to learn. For any other gamer, it is a test of good communication, command structure, risk assessment and confidence – all qualities I am sure that any Navy Seal would need. And when a mission is accomplished, arms will be raised in victory – a sign of a truly immersive and expertly designed game experience. You are a Navy Seal. You are trained to confront terrorists and insurgents. You’re on a mission. You work as a dedicated team. Careful planning and precise timing improve your odds of success, but unforeseen events could jeopardize the mission. HOOYAH is a cooperative card game in which 1 to 4 players assume the roles of Navy SEALS trying to complete a real-life inspired Special Ops mission. You either win or lose as a group. To meet the rigorous requirements of the mission, you must collect all the Skills & Equipment Cards required for each Op. All phases of the mission must be completed without the loss of life and before time runs out. Leave no man behind! A game overview and review by Tom Vasel and Sam Healey. Mr. Fitzgerald’s strength is in designing traditional card games with a light dusting of subject matter, and that’s definitely the case here. It’s worked in the past, but not so much in Hooyah. He really does try to sell the Navy SEALS concept- in each description of the game’s included missions he at least tries to explain why you’re using particular colors to overcome obstacles since each coordinates at least in name to a SEAL skill. But it just doesn’t provide enough of a transitive layer to put the player in the situation and communicate the danger of the kinds of operations that SEALS take on or the almost superhuman skill with which they execute them. Character cards with negligible special abilities don’t equate to immersion or engagement. It’s a cooperative game, and most of what goes on consists of drafting cards either from a display or a blind draw from a deck. There are some equipment cards that generally let you pair them up with other cards to make another color or provide a special function such as resetting the display. There’s a really quite cool timer mechanic whereby players only get a certain number of drafts before they start losing health, which adds a nice and rather unexpected degree of tension to a mundane game process. One player is a Lieutenant Commander, and at any point he can make a Roll Call- this is a smart way that the game gets around the “what cards do you have” groupthink that can spoil card-based co-ops. If the LC feels like the players have a good shot at making it through the current of five Ops (really just a pair of colored, numbered cards that indicate how many and what kind of cards the team will need to discard), it can be executed following a round of Events. It’s almost laughable to call them events, because they’re really just unexpected penalties and discards. Make it through, and if there was any time left on the clock from the preparation round there’s a bonus. It all ends if any player loses all of their health from failing skill checks or random events. If you haven’t already sorted it out, I’m not very impressed by a game that calls itself the “Navy SEALS Card Game” that boils down to lots of card drawing and discards, occasionally showing you a picture of an assault rifle on a card. I really admire Mr. Fitzgerald’s attempt at bringing in historical missions with included descriptions and as a highly abstract, family card game it might be successful with some groups look for a low friction, low commitment card game. That said I’m not quite sure why it needs 40 pages of rules, even if it is a small format book. It’s also a fairly easy game although there a couple of ways to increase the difficulty. But they’re silly- take one less health at the beginning or whatever. The missions are all more or less the same, just requiring different discards. One or two have some minor alterations, like an Insertion card that comes up or that handicaps one of the team members since they’re protecting a hostage. Hooyah: Navy SEAL’s Card Game is a fun and quick co-operative card game that lets you experience the preparations, training, and execution of Navy Seals’ missions in games of 1–4 players. Each player takes on the role of a Navy SEAL (representing different specialties, such as sniper, diver, communications expert, interrogator, and medic) and together the team tries to tackle a series of Ops (operations) that make up a larger mission. The box contains 10 Navy SEAL’s cards (i.e. player cards with varying specialties and skills), 75 Ops/Event cards (representing the difficulties and dangers of Ops), 75 Skills & Equipment cards (these are collected in the training and preparations for each Op and are used to complete the Ops), 5 mission cards (each one representing a different scenario), a mission card holder (to display the mission card clearly to all players), an insertion card (representing the complexities and dangers of aerial insertion in some of the harder missions), a turn sequence card (a quick-reference card, which shows the parts of each phase), 30 Health Tokens (representing the health of each Navy SEAL), a time counter device (a neat looking compass-like time counter that shows how many phases the SEAL team have left for the current Op), and an Instruction Manual (i.e. a rulebook). Hooyah is a cooperative game. As mentioned above, each player takes on the role of a Navy SEAL in a team of 1–4 SEALs. If you are 2–4 players, one player takes on the role of team leader (and thus plays with the “Lt. Commander” Navy SEAL card). After choosing a mission and setting up the game, the players starts preparing for the first of five Ops that constitute the bulk of each mission. The time is often very limited, which means the Lt. Commander (the team leader) needs to make hard decision on whether the SEAL team should engage the Op or make more preparations (which soon will cost you a lot..). The players gather equipment and train in different areas that will help them execute the Op. When the Lt. Commander is confident that the team will be able to complete the Op (or when he decides that they need to get going before its too late) they get at it. This means overcoming an increasing number of events and fulfilling the skill demands of the Op. The game proceeds through five Ops that are increasingly difficult. When the team has completed the fifth Op they immediately go to the Mission Phase, which basically consists of a special Op without any room for preparations. If they manage to tackle it the team has won the game and can count victory points. If they do not—or if at any time during the game a players looses his last Health Counter—the team has lost the game. Hooyah is very easy to learn and play, in terms of the difficulty of the rules. The rulebook is quite brief and includes several examples that show how the rules are enacted during game play. In terms of difficulty for the Navy SEAL team, Hooyah provides a very varied gaming experience. The five missions included in the box are increasingly difficult and each mission also comes with two optional rules, one for an easier mission and one for a harder one, which provides variation and added game value. You will probably like Hooyah if you enjoy a quick co-operative card game and can provide some of the special ops feeling for yourself. The cards are informative and have a strict beauty, but they are almost devoid of fluff and extra information, which means that you need to take extra measures to get into the ambience of being part of a Navy SEAL team. Among the pros are the easy rules, the short game time (usually around 40–60 minutes, but only 15 minutes in solo play mode! ), and the increasing difficulty of both Ops and Missions. Among the cons is the fact that the box only includes five missions, that it gets somewhat repetitive after a few gaming sessions, that the scoring rules are seriously broken [see “Game Tips” for a solution to this, however] and there does not seem to be any expansions planned, which might provide some needed variation. At only $25 (MSRP), Hooyah is not expensive at all and it includes a lot of good-quality game pieces. Hooyah is a fun co-operative game that can be quite challenging. With the right attitude, you will have some great sessions with it. I really enjoy the fact that the game is not just about executing Ops, but as much about preparing and training for them. Also, the rules for solo-play are excellent and do not significantly alter the difficulty level while they provide an opportunity for 15-minute Missions (I kid you not, it is a great feature). How much does theme really matter in gaming? Do some games create an immersive experience that makes players feel they are doing something more exciting and adventurous than rolling dice or collecting cards? I think the answers will vary from one gamer to the next. But if a game is sound and has good mechanics, theme is less important. I like Splendor, but when playing I don’t feel like a gem merchant or miner. The diamond and sapphire chips are really just white chips and blue chips, but I still love the game. Hooyah: Navy Seals Card Game is a game that has lovely thematic elements everywhere except the gameplay itself. It is, at its core, a cooperative set collection game. Players choose from one of ten roles, and each has a unique ability. One player assumes the role of the Lt Commander, and he is the game leader. Players must complete five tasks, called “ops”, then complete one of five “missions”. Completing ops and the mission requires that players collectively obtain the required number and color of a group of cards. There are two numbered cards in each op. The sum of the numbers on the two ops cards is used to set the timer. The timer is used as a player turn counter. Each time a player takes cards from the draw deck or from a diminishing number of face up cards, the timer is reduced by one. When the timer reaches zero, players lose a health token with each addition draw. If any player loses all his health tokens, the game ends in a loss. As gameplay progresses, the Lt Commander can “call roll”. That means that each player tells the group how many of a specific color of the required cards they have in their hand. It is a cooperative game, so players have an incentive to share pertinent information. It works a bit like the sharing and memory element of Hanabi, but Hooyah seems a bit less restrictive. Once the Lt Commander feels the group has enough cards to complete the op, players play the number of required colored cards. After the five ops are completed, players must have the cards required to do the mission phase of the game. The mission is usually a specific number of three different colors of cards. That’s essentially it. Get as many of the five different colors of cards, and hope the group has enough to fulfill each op and the mission. Hooyah: Navy Seals Card Game is an attractive game with good looking components and a very useful box insert. It plays 1-4 players, and games last 15-20 minutes. I find it relaxing when compared to other coops, and sometimes that is good. Don’t expect a deeply thematic experience with this game. If you approach Hooyah as a light, cooperative set collecting game, you wont be disappointed. In Hooyah, the players represent a team of Navy Seals that are attempting to complete a Mission. In order to complete this Mission, they must successfully execute several Operations, during which Events can occur that might impede their progress. The game is broken up into a series of “Preparation” and “Ops” phases. In the Preparation phase, players are able to draw two cards – either from a face up group, or from the deck. They may also play Preparation Equipment cards. When deciding on cards, they are generally looking for colors that match the current “Ops” cards. Once the Lt. Commander (one of the roles), feels that the team is prepared for the Op, then they call “Hooyah” and the Op begins. At this point, a number of Events are handed out to the players. The Events can be skill checks that you can pass by discarding a matching card, they can force you to lose Health or cards based on a condition, and they can do a few other things. Once all of the Events are completed, the team goes around playing cards until they play enough cards to pass the Op (for example, they might need 5 purple and 3 orange cards). If they pass the Op, then they might gain extra Health, depending on how long was spent in Preparation. If they fail the Op, they lose Health and start over on the Op, after discarding their hands. After five Ops, they must immediately (no Preparation phase) each face one more Event, and then attempt their Mission (which works just like an Op). If they succeed on the Mission, then they have won the game! The first thing to discuss about Hooyah before even getting into pros and cons for the game is the theme. The theme is definitely American oriented, and more specifically, patriotic American oriented. In fact, each of the missions is based off of a real life Navy Seal mission. That part I think is pretty interesting (you could even call it a “pro”). One of the specific missions that people will probably easily recognize is “Mission: Compound Raid. Objective: To capture or kill Osama bin Laden.” So, I think that some people will really enjoy the theme quite a bit. However, I can see a lot of other people actually being turned off by it. Yet, with all of that, I felt like the theme was a bit shallow when it came to actually playing the game. Essentially you are worrying about matching colors much more than you are worried about why you are attempting to complete a Mission. So, the Compound Raid is a “2 Yellow, 3 Red, 2 Blue,” and this means much more to you during the game than anything else. This leads to the next con for Hooyah – the tension in the game doesn’t seem balanced correctly. In most co-operative games (Pandemic comes to mind) bad things are happening. You try to keep them in check. Slowly, you feel more and more like your hair is on fire, as there is nothing that you can do to stop the onrushing doom that is coming! Your only hope is to reach the game end condition just seconds before you all die. That’s really one of the fun things about co-operative games – feeling like you’re about to lose at any given moment, yet having the ability to reach out and steal a victory. Hooyah is basically the exact opposite. You very rarely actually feel like you’re doing poorly. In all of the games that I’ve played, we’ve been easily slaughtering the game. And then, at the end, we hope that we don’t draw an instant death card. Because if we do, then we had a loss handed to us in the midst of our victory. The last con that I had for Hooyah was that I felt like there weren’t very many meaningful choices. Basically, it was “hey, that card is the right color – I should draw it.” There are a few choices for the LTC to make – specifically, when should the team attempt the Op, but most everything else is a bit trivial. Part of this, I believe, is that the Equipment cards don’t serve much of a role. I believe that one of the choices that you are intended to make is “should I use this Equipment card.” (Equipment cards can do things like letting you discard two other cards to make a card of the needed color.) However, since the game is generally easy enough that you don’t need to utilize the Equipment, you get back to just drawing the matching color and hoping to not draw the death Event. Theme – You are a member of the Navy seals taking on different real-life missions. Mechanisms – Co-op card game with a similar mechanism to TTR to get cards, but cards can have special abilities as well. Players grab cards to fulfill random events and a known op. 5 known ops must be accomplished before attempting the final mission. Unique aspects – Even if you had enough cards to fulfill the known op, the random events that happened might ruin your plan so you have to over plan before going to fulfill the op. You get more health though if you don’t take as long to gather the necessary resources so there is a fine line to balance. Good/not so good – Sometimes the events did too much damage, but it was balanced that if you failed an op you could attempt a new one after discarding all of your cards and taking one damage. The play time of the game wasn’t too long so any major complaints were mitigated by that. It wasn’t long enough to really make me frustrated. The addition of the special cards to the TTR mechanism allows for some familiarity with a twist. This could easily be a small step up for players of TTR or new people to co-op games. The publisher’s review gives a very good explanation of the actual game play so I will concentrate on my impressions of the game. Rulebook- For a fairly straightforward game I found the first reading of the rules to be a bit haphazard and confusing. Read the rulebook THUROUGHLY before playing. By this I mean read the examples and sidebar materials. Also and comprehensive reading will clear up a lot of terms. Overall, our 1st play after 1 reading led us to misplay a major rule and consider the game too easy. When we replayed with our mistakes corrected it was a much better game. Now I know that every time you 1st play a game you miss things in the game, but the rulebook is not organized in such a way as to make everything easy to pick up. Game terminology especially should be explained to the players before it is used as an explanation for something in the rules. It would also help if all of the relevant information for an action or game component were located in the same place in the rulebook. After we corrected our understanding of the game’s rules the subsequent games were much more enjoyable and we found it to be a decent, fast game. However, there are only 5 missions to undertake so I wonder about replay value in the long run. Sadly, there are a lot of games on the market and more arriving all the time and I just don’t see this one holding it’s own at the gaming table. 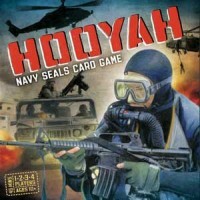 Add a Review for "Hooyah: Navy Seals Card Game"